I'm not a big Sims 4 player, but I'm attempting a Legacy for the challenge and the fame! No story here, just some fun goofing off, pictures, and 10 generations of pure, beautiful, pink-haired, pink-eyed children! 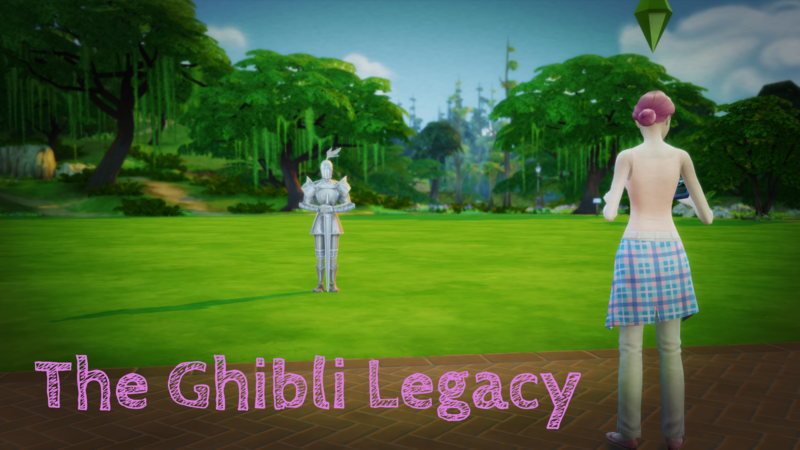 The theme of my legacy is characters from Ghibli movies to add an extra layer of fun! Slight disclaimer: I have a potty mouth. I use it sometimes. Like when I'm speaking. Got the first two chapters up! Oooo! I'm going to read this tomorrow when I'm more awake! Ooh! I hope you like it, I'm REALLY having fun, even though I'm not very good at the sims 4 yet, lol! When hunting meeting potential spouses, try hopping from neighborhood to neighborhood. The game only spawns a certain number of townies at once, so if you don't find someone you like, try a different neighborhood and new sims should pop up. haaaaaaa! I love that everyone was sitting on her bed! Your score sheet is AMAZING! I love it! I would totally use that if I was playing a strict traditional legacy! As it is, I tweaked the one I'm using for my Ugly Prettacy. And finally, Congrats on the baby and promotion! Whew! That was a lot! Can't wait for more! And if you have any Sims 4 questions, just let me know! I wish I would've known that, lol! Haru only ever went to the same library and gym in Willow Creek! That actually makes a lot of sense though why it took so long, though I don't regret it. Erick is a catch and I got SUPER lucky for the start of my legacy. SHOOT I just lost the game again! MAYBE one day we'll break this chain! yes, librarian-spouses-in-arms! It's useful, and someone had told me at the time that we couldn't marry townies for the spouses?? I checked the rules and didn't see that, but they also don't include a lot of things IN their rules which I find annoying (meaning from the challenge website). It actually doesn't even TECHNICALLY say that you HAVE to wait until birthdays to age children up (though they detailed it in a comment by someone way deep in... but seriously if it's a rule, include it with the rules!) I'm opinionated! Well maybe not, knowing me I'd make it to gen 6 with the cake and some greedy sim would EAT IT before I could candle it again! Thank you! I kind of got carried away. It was supposed to be just for parties but I thought "while I'm here..." I have the printout version of the Legacy Challenge score sheet but I just... can't bring myself to mark in it (mostly because it's missing things I want to keep track of... LIKE parties). Thank you so SO much for reading! It's much appreciated. I'm fumbling a lot, but it's fun! I wish someone had told me about the cake thing when I first started. It would have saved me LOTS of money! Pro Tip: The fire alarm is useless. There are no firefighters in TS4. So the alarm is a waste of money. I would spend that money on a sprinkler system instead (located where you get the fire alarm) That way if something happens and you can't get to extinguish it, the sprinklers will put it out. Do you have a Gallery download of Mr. Mutton Chops available, perchance? He is so nerdily handsome. Side note - when I saw Katrina Caliente sat at the Library computer, I thought "Oh my God - this is happening in the Miskin universe!" Hilariously I remembered the fire alarm was useless, I just forgot about the sprinklers... lol! Also I think they were really broke at the time, so that didn't help. Oh my gosh I actually ran into this toddler parent frustration later and was laughing so hard! I think it was when I was spamming "ask why" and the parents were having NONE of it, lol! It's great! Thank you, thank you! I can absolutely put him up on the gallery, uhh let me do that now so I can tell you what I tag him under. He'll be under Erick Ghibli... I don't know how to do "clean slate" versions of these sims... uhh I used him as a base for another sim when I was play testing and all of his skills transferred? ('scuse me while my noobery shows). Anyways booting up the game now so I don't forget and...ok so I put him up on the Gallery but I swear I have 0 idea what I'm doing so I probably didn't do it right. He doesn't have CC but the game recognizes him to have CC (from the default replacement eyes, I'd guess). I'm Livvielovesims and he's Erick Ghibli; all he needs is parenthood! Have at him! Love Haru's New (not so new? Since you kinda already showed us this?) look! If you really want Erick to have friends, there are usually other sims walking by. In that particular neighborhood, they're usually walking the path behind your lot or fishing by the water in front of your lot. That way you don't have to deal with the loading screens and still make friends. But it looks like Erick has his hands full! That no promotion glitch also occurs with kids in school sometimes. It's very sporadic and annoying. Well then! Haru is one sim I would not want to cross! Kudos to her for getting revenge on Vlad! The promotion glitch nearly drove me mad! I was like 'OK I know they ramped up the difficulty for promotions in the Sims 4 from previous iterations, but this seems RIDICULOUS!' and it was. I now regret waiting so long to fix it! but we can't win them all. LET'S BUILD A BOX AND LOCK HIM IN IT. We need the death points anyways! Who could argue with that logic? Yeah, I tried the high chair too hoping it wouldn't be as annoying as the ones in TS3. I was wrong. They're worse. I never buy them anymore. You actually taught me something! I didn't know you could tell children about pregnancies lol! Good to know! The teen phases are the best! They way the mope around the house is hilarious! And my favorite child phase is the bear phase! I DO have Get to Work, but when I did a Hospital Birth (even before I heard about the trick) it didn't actually fill up her needs! You know I was really hoping for some high-chair cuteness and had *no* idea that tots could be that fussy! I play-tested on 3 toddlers prior to Howl, and ALL OF THEM did just fine with the high chair, I had 0 idea that it was even possible, so needless to say that was a miserable first encounter thanks to Sophie. Woohoo! I'm learning enough to possibly be useful in offering advice to someone else! The problems I have with the advice is the sacrifices. I'm trying to get all of the positive traits on my kids and it's SO hard to get some of those traits up! I'm hoping this will get easier with time, but it feels like so much juggling! I'm well into two teens (almost all teens) and I love how dynamic they are so far! Thank you so much for all the positive comments and advice! It's really helping me stay invested. I've been trying so hard to get out all the backlog I have so I can resume playing this family! I can get all five positive traits but I cancel all advice actions in order to do it. It felt like I had to have the parents avoid the kids to get five positive traits. Which I hated. I'm starting to feel that way too, Teresa, though honestly I just have no idea how to raise "Conflict Resolution" for teens without starting some big fight (thus lowering it). I finally figured out how to work on Emotional Control (which took we way too long for Howl and Sophie to likely get those traits). Manners feels STUPID easy to raise, along with responsibility (just doing their homework every night seems to max that sucker out)... Empathy is... challenging but if you've got a few days/evenings you can dedicate to volunteering it's not too bad. Emotional Control is NOW easier that I realize I can just use "Unwind to music" and take them for jogs or writing in a notebook, but the Conflict Resolution for teens is near impossible! Children can "learn to say sorry" which I'm starting to do now with the ones who are STILL children, but it still seems so small in comparison. I don't know how to avoid the ask once it's up, but do you cancel the interaction when you see it happening? I like that they ask for advice but at the same point I hate that it's so hard to raise/lower these traits. 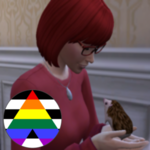 I honestly might look into a mod because it's no fun for me to parent and get those traits if that's the only way I can! The method I used is to have the the parent teach the children the two that they have the option to teach: Please and Thank You (Manners) and Sorry (Conflict Resolution). Then as teens I have them work on Empathy by spending one weekend day doing back to back volunteering (5-6 in row gets them in the range). Emotional control gains by jogging after school each day - I had better luck with that over unwinding to music. Responsibility just comes naturally. But then I monitored all communication with their parents and canceled every advice action. Nothing you do to the toddlers makes much headway unless you want the negative values - those start early and get a good build - bad manners is easy by using burping and farting and it is hilarious to watch toddlers. And negative emotional control is fun to watch as they grow up. But I never could live with negative responsibility or the other negative ones. Thanks Mojo! I'm going to need it! I also noted you had a similar issue with the twin drop, lol, it seems the game is out to get us! Thank you so, so much Teresa! I love all this information, I can add it to my arsenal of things. I probably will start canceling advice, because I find it to be a bit tedious anyways.